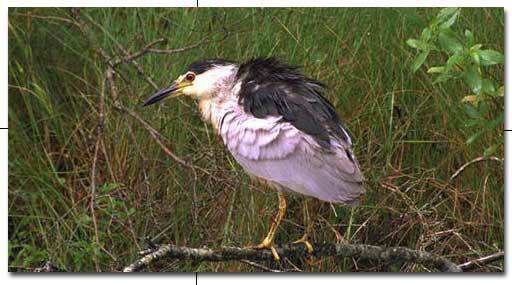 The black-crowned night heron has a typical heron profile, but with a stouter bill, neck, and legs. The bill to tail length of adults are between 58 to 72 cm. The adults have a greenish black sheen on the crown and back. The forehead, face, neck, and under parts are grayish white. There are two to four slender long white feathers extending back from the head. The bill is black, the iris red, and the legs and feet are yellow to reddish. The Black-crowned night heron were first observed in Alberta near Strathmore during the summer of 1958. Since that time they have been seen as far north as the Edmonton area. The black-crowned night heron nests in colonies and makes a nest of sticks usually in trees, occasionally in bushes and rarely on the ground. The nest can contain 3 to 5 pale bluish green eggs. Incubation takes between 24 to 26 days. There is one brood a year.